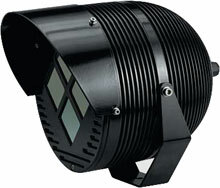 The Videotec IR Illuminator has been discontinued. No direct replacement is available. The IR Illuminator from Videotec enhances viewing capability by generating high quality images at night or during dim light. Made out of die-cast aluminum and with epoxypolyester painting they are IP66 weatherproof rated and are excellent for any harsh environmental conditions. Lamps with various light beams such as flood, wide flood and spot are available. They are ideal for military, airport, and prison surveillance applications.